Authorities say a construction worker has fallen 50 stories to his death from a skyscraper being built in downtown Los Angeles. LOS ANGELES (AP) — Authorities say a construction worker has fallen 50 stories to his death from a skyscraper being built in downtown Los Angeles. Fire Department spokeswoman Margaret Stewart says the man plunged from the unfinished tower on South Figueroa Street on Thursday and hit the back of a passing car. Stewart says the driver didn't appear to be injured but she was taken to a hospital for examination. 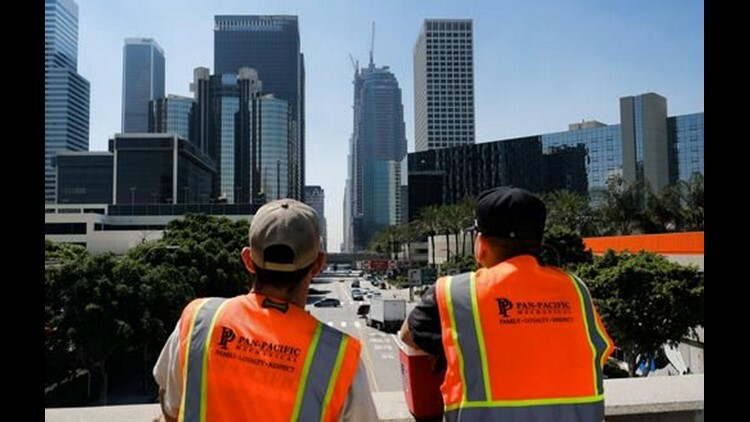 The death occurred at the construction site of Wilshire Grand Center, which will be the tallest building west of the Mississippi. A ceremony was held earlier this month when the top beam was hoisted into place on the 73rd floor. The $1 billion office and hotel tower is expected to open in early 2017.